21 OT practitioners and friends celebrated OT Month at Shepherd Spinal Hospital with food and fellowship. OT and OTA graduates from Augusta University, Brenau University, Chattahoochee Technical College, Georgia State University, Boston, Indiana, Illinois, Massachusetts, and Washington universities exchanged thoughts, ideas, info on their practice areas, job postings, research interests and upcoming GOTA Conference in September. 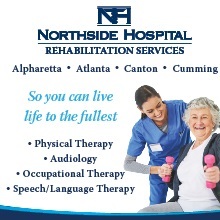 Many thanks to those attending, ATL Region hosts, and Shepherd Spinal Center as venue. HAPPY OT MONTH!!! This conference is a vehicle to assist GOTA and its members in addressing and achieving its strategic goals. Some of these goals will explore alternative practice opportunities, changes and challenges to serving future populations, service delivery within the community and industrial environments, reviewing research-based clinical techniques and equipment, alternative funding resources, grant writing, and developing partnerships for research. Please consider serving as an exhibitor and sponsor at this conference by sharing your products, services and expertise that will assist our members in pursing professional growth and excellence. GOTA expects the conference attendance will host approximately 150 practitioners. Exhibits are scheduled to run Friday, September 27th through Saturday, September 28th, 2019. Exhibitor and Sponsorship forms are due by Friday, September 13, 2019. Special rates have been secured for GOTA at Brasstown Valley Resort & Spa. Book by August 5th to take advantage of the discounted rates. CALL FOR PAPERS TO OPEN JANUARY 30th 2019. 2018 Annual Conference and Business Meeting! 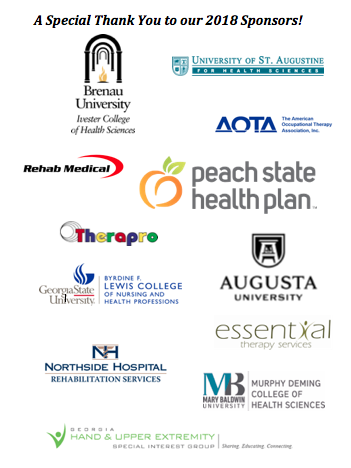 A special Thank You to our conference sponsors! membership for only $45. Please follow the link below to join. "As a member of GOTA, I have access to a professional network of peers across a broad spectrum of practice areas ranging from pediatrics to older adult services, in both private practice and the public sector. Membership in GOTA not only fosters my career development, it also serves as a platform to advocate for Occupational Therapy across our entire state." Feel like you need to make a bigger impact in your profession? 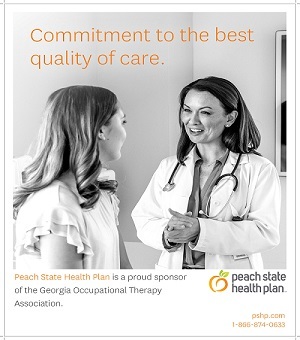 Want to help advance Occupational Therapy in the state of Georgia? GOTA is the perfect organization to get started! We are actively looking for members to fill different executive board and committee positions. If you would like to get more involved, please click on the link below to learn more.